Everyone was asked to leave the Olympia campus or return to residence halls after someone called a local law-enforcement agency with a threat, the college said Thursday. The abrupt closure was announced shortly after 11 a.m. Thursday and the rest of the day’s classes were canceled. The threat stemmed from a call to a business line at the Thurston County 911 dispatch center. In a news release Thursday evening, a college spokesman said an individual claimed to be armed and en route to campus. Evergreen spokeswoman Sandra Kaiser said she didn’t know whether the threat was made by someone with a connection to the college. “They thought it was credible enough that they referred it to us, and we made a quick decision” to close the campus, she said. 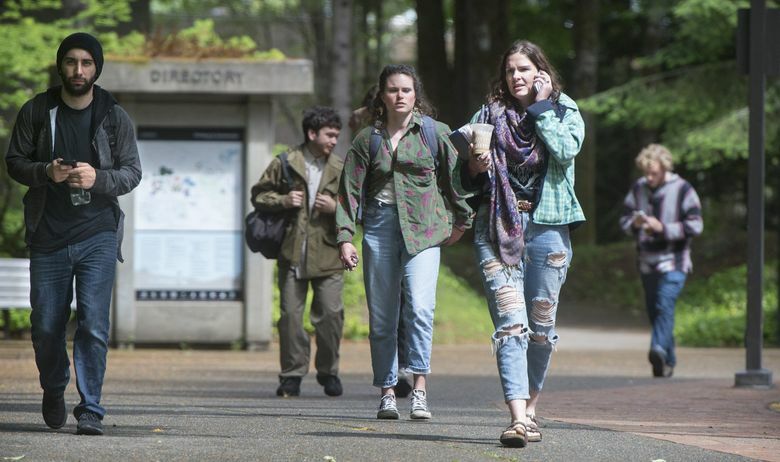 About 800 students live on Evergreen’s campus, according to Kaiser. She added that the campus was not on lockdown, in which residents would be forced to remain inside. 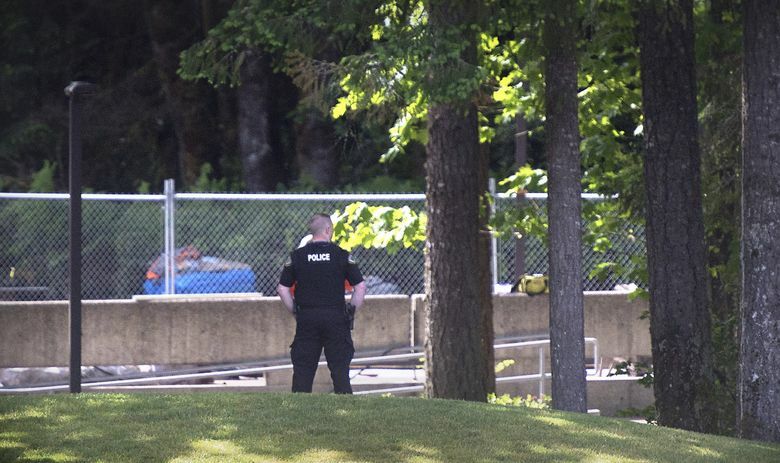 No other details were available — and it’s unclear whether the threat is connected to recent tension and protests over what students say is institutional racism at Evergreen. As the evacuation got under way late Thursday morning, vehicles streamed away from a winding, wooded road. Into the afternoon, officers with the Olympia Police Department and the Washington State Patrol managed a roadblock, waving off motorists trying to enter the college. One of those turned away was Shaianne Luebbe, who had come to pick up her young daughter from child care. Luebbe said that she’d never experienced anything like this at Evergreen. “I imagine that it’s serious,” she said. The threat comes a week after hundreds of Evergreen students began protesting. The campus has experienced mounting racial tension that puts students of color at risk, the student group Expose Evergreen wrote in a news release last week. Students cited several incidents, including an email from a professor who objected to the school’s “day of absence” in April. In the past, students of color have left campus for one day to address racial issues, according to Evergreen. The event comes from Douglas Turner Ward’s play, where a town awakens to find that all black residents have disappeared. This year, however, the format was reversed, with the day-of-absence program designed for faculty, staff and students of color held on campus. The program focusing on anti-racism work from a white — or majority culture — perspective was held off campus. Both programs were voluntary, Evergreen President George Bridges said in an interview Thursday. Professor Bret Weinstein questioned the event in an email that was later made public. Students said Weinstein’s email was racist and called for his suspension. In a list of demands, posted in the Cooper Point Journal, students also called for firing a police officer and a college official. A police officer used excessive force, the students said, after about 50 students approached Weinstein in a campus building. They also say that a college staff member has shown a “consistent often violent flaw in judgment” when it comes to students from marginalized communities and who have experienced sexual assault. All three remain employed. Bridges said the college will have an independent team review the interactions between the police officers and the students. The protests received national attention, specifically on conservative-news outlets. They also caught the attention of state Rep. Matt Manweller, R-Ellensburg, who introduced a bill Thursday that proposes privatizing Evergreen. He also wrote a letter to the state Human Rights Commission asking that it investigate potential civil-rights violations at the college. Bridges said a fundamental value at Evergreen is that it has never shied away from debate. Seattle Times reporters Joe O’Sullivan and David Gutman contributed to this story.